Roasted vegetable season is upon us. 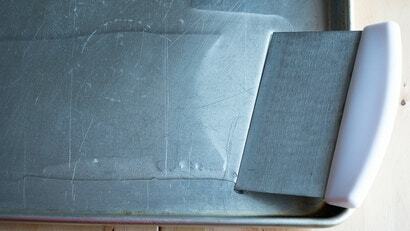 Fortunately, I’ve just figured out the perfect way to oil a sheet pan — and, of course, it involves a bench scraper. The next time you have a sheet pan to grease, dump your oil into your pan, then use the flat side of a bench scraper to spread it around in an even layer. Done. Your pan will be perfectly oiled from edge to edge — no need for cooking spray. Plus, the squared-off shape makes it easy to get the oil all the way into the corners, which is especially great for stick-prone foods such as pizza or focaccia dough. As far as I’m concerned, it’s just one more thing to love about a near-perfect kitchen tool — and if you still don’t own a bench scraper, it’s another reason to finally buy one.